L.U.S.T. stands for Love- Unity- Soul- Trust, a family production company from Stone Mountain Georgia native Dwight Sykes. "If You Want Me" even features a rap from Dwight's daughter Valerie. 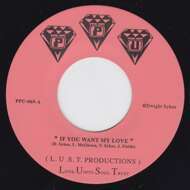 7" single is backed with "You That I Need" from his debut LP Songs Volume One on Peoples Potential Unlimited.